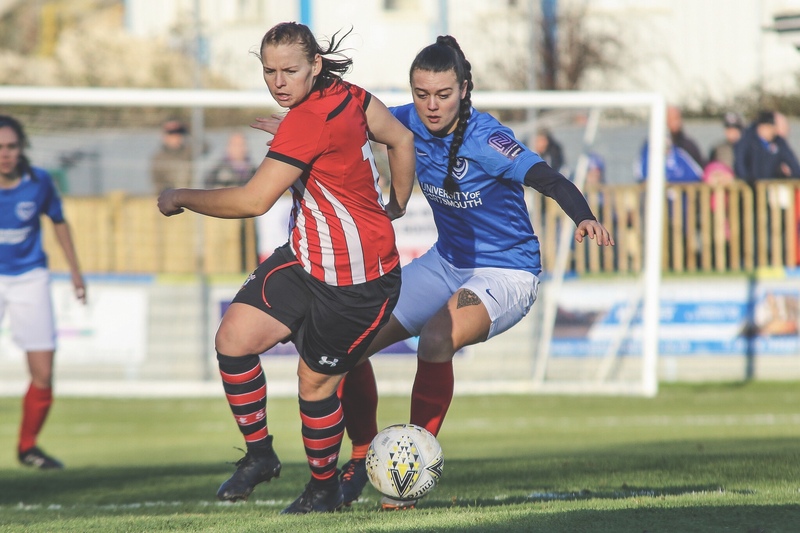 Portsmouth FC Women managed to avoid an Hampshire FA Challenge Cup quarter-final upset against their south coast rivals Southampton FC Women. Chloe Newton gave the visitors the lead, only for Shannon Albuery and Alex Collighan to win it for the blues. 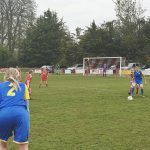 The young Saints side ply their trade two leagues below in the Southern Region Women’s Premier League but based on their performance you wouldn’t have known. They played like a well drilled and talented side who had no fear and nothing to lose but Pompey’s experience and quality saw them through in the end. It was a beautiful day and had it not been for the low temperatures you would have thought that it was mid-July. This clearly helped with attracting a crowd of 546, breaking the record attendance for the PMC Stadium. 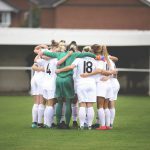 This is a great result for women’s football in the area! 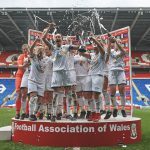 There are teams in the FA Women’s Championship that would like crowds of that number. Jay Sadler made one change from the side that beat off C&K Basildon the previous week. 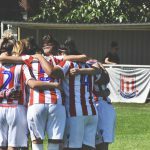 With Robyn Levett announcing her departure from the club, Melissa Burns still recovering from injury, 17-year-old Jaime Rowlands replaced the cup-tied Hannah Haughton in goal. 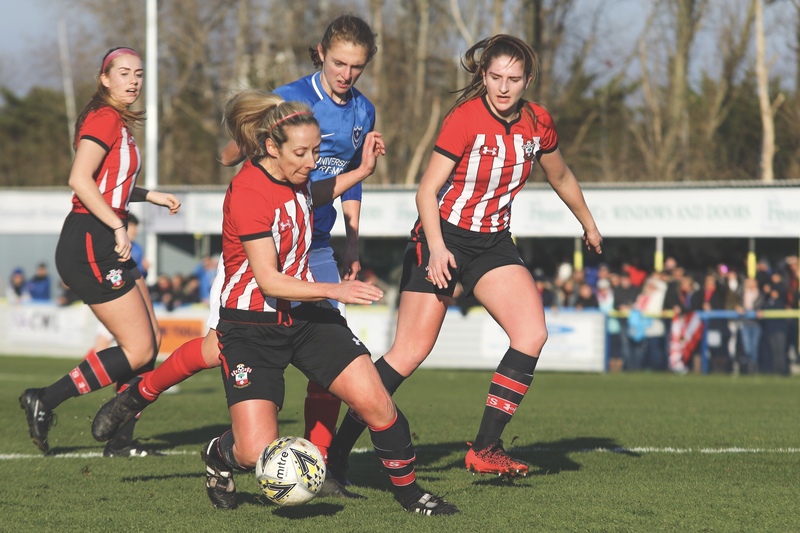 Marieanne Spacey-Cale‘s side featured former Pompey players Megan Jones, Shelly Povan and Shannon Sievwright. The first half began quite evenly, both teams competing well but neither able to create any clear goalscoring opportunities. I would probably suggest that Southampton even looked the more composed side. 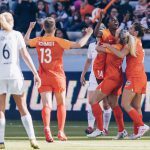 Rachel Panting and Shannon Albuery were reunited up front and linked up well. Centre back Caitlin Morris and the rest of her backline were impressive and looked composed, calmly playing the ball out from the back. 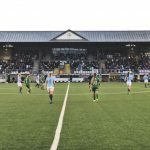 Saints’ captain Provan was able keeping Northern Ireland youth international, Alex Collighan, quiet for much of the first half. After 18 minutes Georgie Freeland flicked the ball into the path of Chloe Newton, who held off the defender and was able to finish passed Rowlands. Pompey nearly responded immediately but Ellie Kirby‘s shot failed to test the Saints keeper. 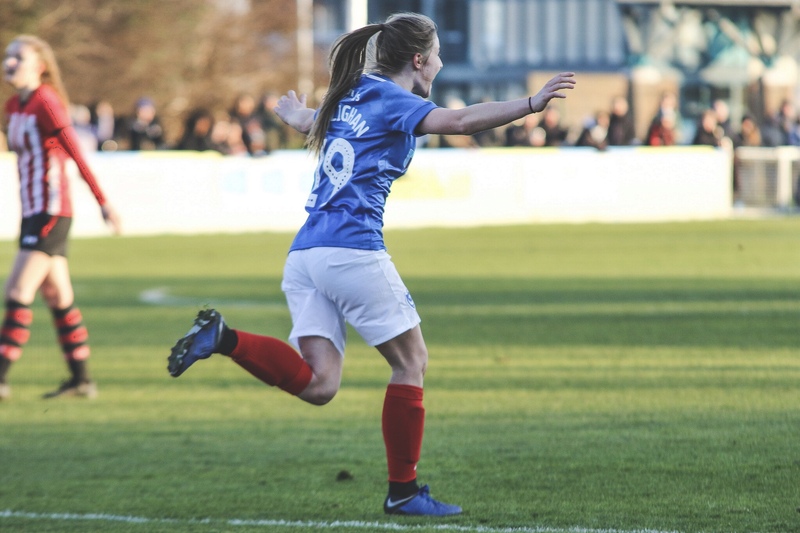 Panting thought that she had given Portsmouth the lead when she tapped in from close range but the assistant’s flag ruled her to be offside. Some Saints fans who were with the play thought that she was onside, not that they cared one bit! 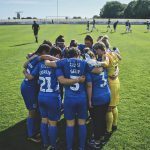 Portsmouth came out in the second half knowing that they had to up their game if they wanted to retain their trophy that they had won for the previous ten seasons in a row. The blues certainly went up a gear and pressured Saints quicker and pinned them back into their defensive half for large periods of the second half. Despite that pressure, Saints appeared to cope well with the pressure. 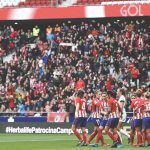 In the first half they were able to pass the ball out from the back but by the hour mark things were getting a little more desperate and they were forced to just clearing the ball our to ease the pressure. 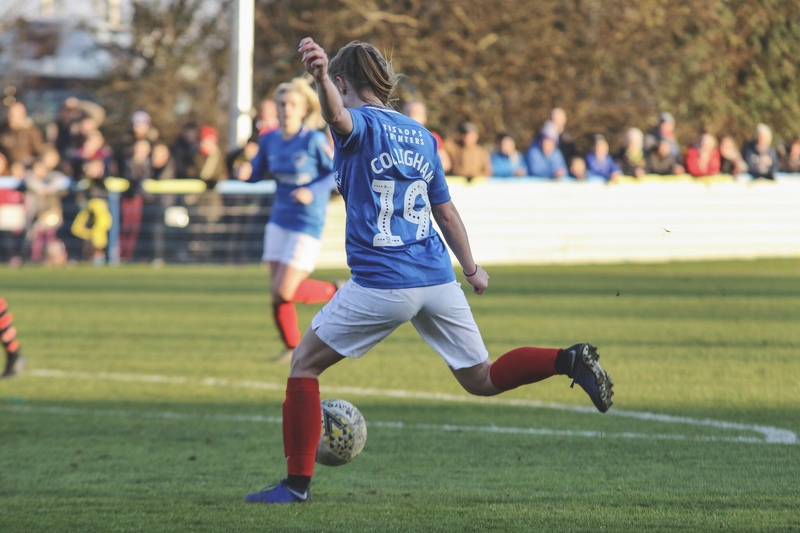 Caitlin Collighan, sister of the Pompey forward Alex, looked like she was going to score a second for Saints but fired over. Instead the important second goal of the game went to the blues. Panting’s low cross squirmed under the otherwise impressive Kayla Rendall in goal and Albuery was able to tap into an empty net. You could see the disappointment for the Saints defenders faces, with one or two dropping to the ground. 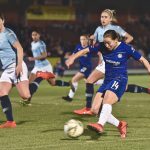 Portsmouth were clearly given a boost by the goal and finally broke down their stubborn defence when Alex Collighan curled in a lovely shot to give the blues the lead. From this point, the blues never looked like letting the lead slip despite one last push from Saints. The final whistle was greeted with a huge celebration from the Portsmouth dugout, they knew that this was an important win in front of such a large crowd. Portsmouth’s prize for winning the tie is another home match against Southampton Saints Girls and Ladies. 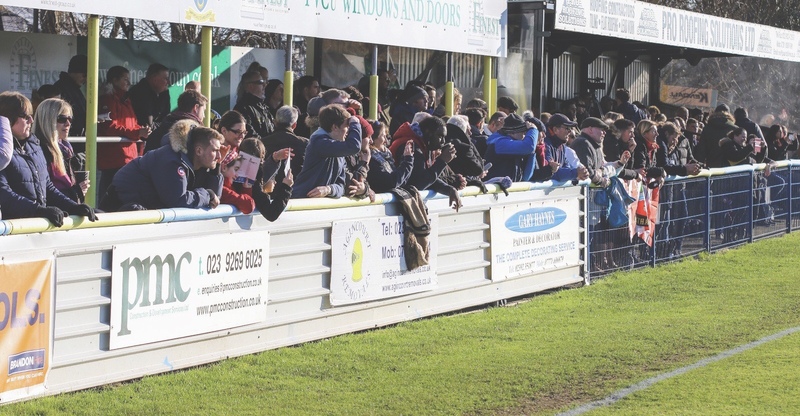 The tie will be played on Sunday 17th February and the blues will be hoping for another large crowd to see them through into the final.